Recently a member here pointed out that my Superbird may have the wrong style bumper jack? I started to look into this and have found my self with more questions than answers! Did all 1970 model year Plymouth B Bodies built at Lynch Road have the same style "T" bumper jacks? Since all our Superbirds were built at Lynch Road did they all have the same style "T" bumper jacks? Did all 1970 model year Plymouth B Bodies built at the other plants have the same tubular style bumper jacks? Did all 1970 model year Plymouth B Bodies have gray jack hooks, bases and mechanisms? Owners of original cars your input is needed with pictures if possible. To start this off my first picture shows the end of one of the "T" masts and it looks more like a "Y" to me? My second picture is of what I think our jack bases should look like. My 3rd and 4th pictures are of what I think all the jack hooks look like. This is the only item that has a part number stamped into it 2931 103 with 10961 under it. Every original jack hook that I have seen on an original Superbird has had the small text. I have yet to see a tube post on an original Superbird. I have never quite understood why the asking prices on 1970 RR/Satellite/Belvederes hooks are so high. After all they were on every RR/Satellite/Belvedere. It is a one year only item, but most every jack hook is a 1 year only item. I believe Tony's repro jack hooks have the large lettering. 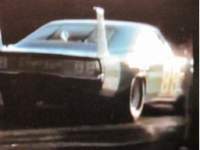 It would be nice if someone could show the original Superbird Tire Iron dimensions and angle on this thread. 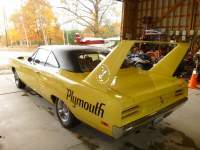 Some of us have a number of Tire Irons and it would be nice to have the right one in the Superbird Trunk. This is exactly what I'm getting at! I took for granted that ALL the hooks were the same and now there is LARGE and small text! Any one with a LARGE text hook to show the difference? Every hook I have had or seen including mine has/had small text.It was the same jack assembly for the base model,would see no reason to differentiate for a bird.Everything in my car is what it came with,if I get a chance I'll measure the tire iron. Do you know what vehicle the LARGE font BLACK jack hook is from? See the 5 digit numbers under the part numbers? Those are the vendor codes, so these were supplied to Chrysler by at least two different vendors. Sorry John, I don't have a clue as to where I got from. It does look to be originally black and from what I can tell they look identical other then the stamping. This is why I'm asking if there are more than one jack? I thought Chrysler had 2 suppliers whenever possible? Could there have been a different jack in a Superbird from Lynch road? Could it be a tubular mast? Could the base, hook and mechanism be painted black? Even then, there are variations. 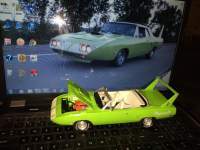 The Superbird just posted abut here vin# RM23UOA171606 looks to have a tubular jack mast? Maybe someone can get a closer look? Mine has the T style. Now it's time to dig deeper into this! I have contacted Nick of Nick's garage to see if I could use his pictures. He gave me permission so I have attached 2 pictures of what has been on his site for years. These pictures are of a correct jack for LYNCH ROAD built 1970 Plymouth B Bodies. The example also has a date code of 9 L or November 1969! This is significant as this is the month Superbirds were being built! I want you to pay close attention to the angle leading up to the hook receiver. There is a oval depression that I assume is for strength on both sides. Take a look at your Superbird jack mechanisms and see if they have them? So would one deduct, of the apparent different vendors used for the hooks, one used a small font while the other was large? Also the large font vendor had some black hooks and some gray hooks! Nicks Garage is a very good general site for Mopar items. 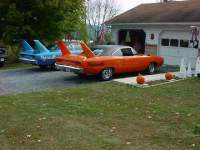 For actual Superbird parts I would tend to look at Superbird survivor cars. The 17 mile car and others like it. Freshly restored cars on e-bay tend not to be reliable restoration detail sources. 48 years later a lot of cars have replacement jacks in the trunk. November '69 jack parts, could be, but do you believe they were delivering new jack parts the day the cars were made? I will fully admit to being away from my cars for a few days, so I can not look in my trunks and the dates on the posts. Personally, I would be looking for a small font grey hook and not a tube post. I would have to agree with low mileage Superbird survivors for the best answers. I have worked in an assembly line situation (not automotive) but there were many times when we would run out of parts on the line. These cars were built over a 3 or 4 mouth span so anything could have happened. A jack sure wouldn't hold up production. Were the jacks installed after the cars were converted or before? Did a dealer pull a jack out of a unsellable superbird and put it in a satellite that was missing one or vise a versa? Who really knows. From what I have been able to research it looks like the small font hook and the T bar jack are the most common. Still no idea of what tire iron would have been in there. Here's a pic of the jack assembly from the B5 4spd car on ebay right now. Supposedly a 27K mile car purchased from the original owner in 1978. It appears to confirm the concensus on a 'T' type mast with a grey hook, base AND mechanism! No tire iron in the picture! The one thing I was looking to see! Thanks for posting the picture of the Superbird jack assembly! The jack mechanism also has the oval depression for strength stamped into it along the angled edge! I have contacted the seller and asked if he would flip it over and tell me the date code stamped into it? I also asked if he would confirm the part number on the jack hook?